I know I know, but because he (somehow... must have been a benevolent deity watching that day... one that was highly amused by the action...) survived, I think the Maimed Leg would have been a decent outcome. How about we simply look at an actual case to get a feeling for those traits and discuss what is reasonable? He is a ranger but was raised as a commoner, although he learned to hide that in his pronounciation and demeanour. Nobles will still look down on him in many cases because of his low birth. Background - Noble Warlord; Mastifus grew up in a small fortified manor on the the Mystmountain frontier, and had to fight from a very early age. While he does possess impressive fighting skills, he found his true strength lay in commanding others, and inspiring them to greater deeds. He is of a noble heritage, but his family and lands have been wiped out. Relation bonus with soldiers and militaristic nobles, penalty with peaceful or pacifist characters. Members of the Order of the Dragon enjoy a high standing within Ravenstern due to their position as the guardians of the region, and their exceptional track record in doing this (Respected in Ravenstern Trait). Mastifus, as the leader of the Dragons has earned himself a higher degree of respect (Renowned in Ravenstern). Significant relation bonus with other Ravenstern Nationalists, small bonus with people from Ravenstern, small penalty from unitary people and large penalty with those who dislike / hate Ravenstern culture. All members of the Order of the Dragon have exceptional endurance thanks to having endured prolonged campaigns in the frigid North. Additional stamina, toughness and a powerful constitution. Injuries which would maim an ordinary Knight become just a flesh wound. Mastifus has built up a persona of being intimidating to others, and his scarred, battleworn features only enhance this effect. Bonus when trying to intimidate others. They used to say "As unmovable as a mountain", now they say "as unmovable as Mastifus". Exceptional mental fortitude and determination, but can be as stubborn as an ox. Mastifus is a very accomplished swordsman (1 handed with shield, and 2 handed), though he often hides this fact as he prefers to command. Significant bonus using swords of all kinds. Can use complex sword techniques. Mastifus has spent much of his life on campaign while mounted. As such he is an accomplished rider. Can command 5 units in battle. Mastifus visibly wears the wounds of countless battles, none more imposing than the mighty scar that runs down his face and through his missing eye. Bonus when trying to intimidate. Bonus with military characters. Penalty with Nobles. Permanent. Mastifus lost an eye long ago in battle. Penalty with depth perception, penalty with ranged weapons, penalty to field of vision (can be sneaked up on more easily). Permanent. Note - I know that Blind currently fits this description, but there should be 2 tiers. One Eyed is more about depth perception and field of view, while Blind is more about hindered sight or complete blindness. Mastifus is One Eyed, Duke Aldamar is Blind. Add the level of each category together, and you come out with the Commander Total. As a result I would suggest command rules are re-visited now that combat has become more well developed. The renowned Flying Griffon comes off as an ordinary knight with these stats. Though his nickname comes from the habit of using a tackling jump to dismount in battles, instead of a legendary fighting ability. But, since I portrayed Haegon as the renowned Flying Griffon before his 'death' and the fact of his 'resurrection' wich should raise some eyebrows.. would someone mind if I added a renown trait? What has your character done that has deserved the renown trait? Controversy over his return? It's not 'heroic slaughter' renown, but it's something. Also if I remember correctly, most nobles (and PC's) that Haegon met after his return had heard of the Flying Griffon before and no further introduction was needed. Though I didn't want to add it before, because obviously it isn't close to the renown of Aranor/Iskar (or Mastifus in Ravenstern). But it could be a renown among certain groups of people, like former followers of Darlion, or those who've read about or fought in the battle of Sarleon. The jumping/dismounting could be a trait, too. As a plus when battles, since it's what gave him the lasting nickname. A renown bonus for people that know about the battle of Sarleon. Well, Mordred introduced the Respected trait with the second level Renowned, but since you also included the Hard to Trust trait I'd say "Well known among loyalists" would be fitting. With appropriate actions in service of the king this could be developed into Respected among Loyalists, where Loyalists applies to all people who either have an affiliation with the Griffon and/or the crown. As for the jumping I'd be rather careful about that. I doubt you can actually jump from your horse when you're in full plate and have your feet in stirrups. The latter would be your only hope for something to push off, but ironically the stirrups are just what holds your feet in place, not even speaking of the sheer weight of the armour. 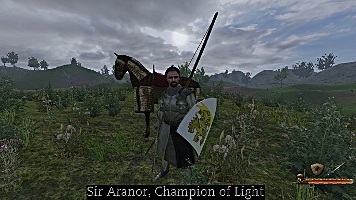 I'd say you could use the flying move when using light armour (leather, a bit of chainmail) granted that your character has a special saddle/stirrups made for him to fit this need. E.g. stirrups that are open to one side, so you can at least jump off to that side without your feet tangling in the stirrups and possible breaking your legs. I'm interested in using the "Well known among loyalists" and the "Barclay renown" traits. "Barclay renown" could be a combination of 'hard to trust' and 'Foreigner', as both traits reference to his time spend in Barclay. Also, jumping off a horse is probably more dangerous to you than your opponent - people have died from falling off horses (though you're unlikely to be landing on your head and breaking your neck when jumping). Orlando Bloom broke a rib failing off a horse.... funny story behind that one. for scars are we going by the I to V thing that Mordred proposed or the original 1-10? What exactly is the command trait based on?